Just as we do not live on a flat world, we do not live in a static 3-dimensional universe.Evidence of our earth seen from space shows us we live on a global planet. Gravity is evidence of the changing landscape of space. Einstein called it a warping of space. Warping as a word indicates bending. Warping is not a good enough word. The actual 'size' of space, the actual dimensions of space, are determined by the rate at which time passes. Space itself grows and shrinks as the passing rate of time increases and decreases. 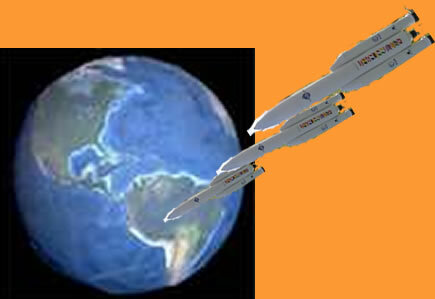 It is a known fact that the faster a spaceship goes... the smaller its dimensions become in the direction in which it is moving. In other words, if someone is holding a ruler on a speeding space ship- his ruler will be smaller then ours even though he sees it as 12 inches. Because he is traveling at extreme speeds and covering large distances in less time, he is in effect squeezing space. But the squeezing is only seen from our perspective. His ruler measures distance correctly. We look at this scenerio and say that the rocket ship shrinks. We do not realize that for the spaceman, the entire universe is shrinking. His perspective is as legitimate as ours and THESE UNIVERSES ARE ONE AND THE SAME! So what determines the true size of the spaceman's ruler? What determines the true size of our ruler? The rate at which time passes. If time is passing at a slower rate for you, than me, then your ruler is smaller and your universe is smaller. Distance for you is not the same as distance for me. Common sense tells us the faster we go, the more distance we cover. Common sense does not tell us that we are changing the dimensions of the universe when we do so. One misconception about relativity is that things are 'simply' relative and its all about perspective. Perspective doesn't cut it. The universe changes its size dependent upon the passing rate of time. PERIOD. Since the passing rate of time is different at different rates of travel, we live in a multi-dimensional universe. But wait.... there is more. You do not have to travel fast to change the dimensions of the universe. You only have to climb to the top of a mountain! Did you know that the passing rate of time slows the closer to the earth that you get? The earth is covered in shells of slowing time. Hmmmmm. Could this mean that the dimensions of the universe are changing as the passing rate of time slows... closer to the earth? Our rulers shrink as we get closer to the earth. Space is not just squeezed but actually smaller. If the entire universe shrinks as we get closer to the earth what kind of ramifications does this have? Einstein said that acceleration and gravity are the EXACT same thing. Huh? How can that be? In outer space you are speeding, accelerating. On earth you do nothing and you fall if you are unlucky to have no ground beneath you. We need to connect the two and understand THEY ARE OPPOSITES of the same coin. When you accelerate you shrink space at an increasing rate. Do you not understand that if you enter a space that is shrinking... that you will accelerate? When you accelerate time slows down at an increasing rate. The slowing down of the passage of time determines the size of space. Gravity is NOT some mysterious, undefinable force. Gravity is EVIDENCE that we live in a multi-dimensional universe. We do not live on a flat earth. We do not live in a static 3-dimensional universe. Dimension is determined by the rate at which time passes. Space grows and shrinks as the passing rate of time slows and increases. Did you ever wonder why we have such a hard time getting clocks to agree? It is not a mechanical problem. If the passing rate of time changes.... then time itself will change. Did you ever wonder why scientist can't get their measurements exactly right? They always speak in degrees of accuracy. Well, if the passing rate of time changes, then the size of rulers change, measurements change. Do you think the two might be related? What is the Pauli Exclusion Principle? You can't determine the exact speed of an object and determine it's exact position at the same time. The closer the accuracy you get on its position, the less accuracy you have on its speed.. and vice versa. Well, no wonder. If the size of space depends on the rate at which time passes- then how can you use your ruler to determine exactly where something is that is speeding and is in a different passing rate of time? Its universe is a different size. You can determine its speed relative to your persepctive. You can determine its location relative to your perspective. You can't determine both at the same time because you are in a different size universe! Now let us consider the size of space. If the size of space changes what effects could this have? Well first we can consider gravity and understand that when the underlying size of space is changing at an increasing rate... it is causing anything entering that space to speed up. A changing spacial landscape causes motion. Let us equate this idea of the passing rate of time to Time Density. Here is a case where spheres will move in response to the density or volume of water. As water warms, it expands or increases its size. Glass spheres in the water remain virtually unchanged. When the weight per unit volume of a sphere is greater than that of the surrounding water, the sphere falls to the bottom. When the weight per unit volume of a sphere is less that that of the surrounding water, the sphere rises. This is a case of differing densities causing MOTION. We could even consider spheres moving in a downward direction as positive or attracted to the bottom. We could consider a sphere moving in an upward direction as being negative and repulsed by the bottom. Of course in reality we know it has nothing to do with attraction or repulsion. It has everything to do with Density. Equate this with Time Density. Time Density causing motion in the same way. But you say- in our world we only see attraction. Gravity is only an attractive force. True. But in the world of electricity and magnetism isn't it possible that it is Time Density appearing as a negative or positive force? Magnetism defined in a new way- A material which changes the structure of space. Metals defined in a new way- A material which responds to this structure. A fact about electrons: They only respond to electromagnetic radiation at certain wavelengths. Is electromagnetic radiation a ripple in the Time Density field? By substituting masses for electrical charges and by using a different universal constant we have Newton’s equation for a gravitational field. I believe that the size of space is constantly being changed by attempting to equalize Time Densities. As Einstein stated- Matter warps space and space tells matter how to move. This equalization process appears as motion and the changing landscape of space. Einstein wanted to verify that a large mass (the sun) warps space in its vicinity causing the light from distant stars to veer in its path. Light always takes the path of least time, not the path of least distance. Interesting that we believe the shortest path equals a straight line and is the shortest time. Not so for light. Light will take a curved path in the vicinity of the sun, a curved path which is faster than a straight line. When stars were photographed during an eclipse they appeared to be in a different location in the sky. Of course we know stars do not change position. It was the path that light took making them appear to jump and thus proving Einstein correct. Most people believe that Einstein's theory affects only huge astronomical distances at near light speeds. They only see the warping of space near a huge body like the sun. Einstein believed this also. Otherwise he would not have waited years for scientists to test his theory under just the right conditions of an eclipse. But we do not need to use light and astonomical distances to prove that gravity warps space. We can use two pennies in place of light and we can use the catenary curve right in our own living room to prove that gravity warps space. In a gravitational field the shortest distance between two points is NEVER a straight line. A curve which follows a path of greater speed then a straight line is a catenary. Because it follows a path of greater speed, it is a shorter distance. This is due to the fact that True Distance is determined by the passing rate of time. Since the catenary in a gravitational field forces an object to travel through a landscape that includes a more squeezed, smaller space (the passsage of time slowing down more), the penny traveling the catenary curve will reach the bottom before the penny traveling the straight line. In otherwards, the catenary penny is faster and there is additional useful energy in that curve. You do not need a large body like the sun to prove curvature of space. You only need two pennys in your own living room and a catenary curve. This is the 'SECRET' of so called free energy. It isn't really free. It is just an aspect of our multi-dimensional universe that those who believe in a 3-dimensional universe do not see. All curved paths require less energy due to the fact that the shortest distance between 2 points in a gravitational field is a curvature.. not a straight line. Viktor Schauberger was using this principle (although he did so because he was copying nature) when he created his trout turbine. The machine was constructed so that a conical-shaped object was set in motion within a vacuum-sealed container. A system of Schauberger's special pipes was wound around the cone-shaped object, that tapered downwards. Water entered from above and could flow through the pipes when the cone-shaped object was rotated by a small motor. Due to the pipes shape and spiral course, the water was 'screwed' towards the center of the pipe and sprayed out through outlets in the lower parts of the pipe, at a tremendous velocity and under great pressure. This was directed onto a turbine wheel, which powered a generator. The special feature of this apparatus was the amplification of the input energy, and the fact that the water, as it poured out of the outlets, rose to the top of the system, to be recirculated. Schauberger claimed that the water rose because it was so strongly charged with biological magnetism or negative gravity. 1. An excess of energy is created by water traveling a spiral path as opposed to a straight path. 2. A cone shaped object when it is rotated is shrinking distance in the direction of its rotation. This is because the passing rate of time which is slowing due to the speed of rotation will shrink space causing water to require even less energy to travel that path. The 90 degree angle of the path of the returning water can use that extra energy gain to push it along the straight line path... appearing to Schauberger to create biological magnetism or negative gravity. Where else do we see something like this? 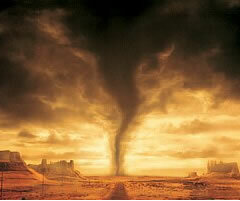 The air in tornados. The speed of air at the top of a tornado is greater then the speed at the bottom. The circular cycloid path that the air takes, requires less energy then the air traveling in a straight line. In effect, it is just the opposite of earth's spacial landscape. It creates a perfect 'anti-gravity' powerful sucking action with this created energy. The passage of time slows as it rises inside the Tornado, opposite to the passage of time slowing as it approaches closer to the earth. This is an example of negative gravity. Supposedly there were more flying saucers. See page 95 LIVING WATER, Viktor Schauberger and the Secrets of Natural Energy. We can believe in a static 3- dimensional universe and say such things are rubbish, or we can take that step of understanding into a multi-dimensional universe where such things are possible. In a static 3-dimensional universe the distant stars are out of reach. But in a multi-dimensional universe where distance and the entire universe itself shrinks and expands with the rate at which time passes - space travel is possible.